All the pictures of figures on this page have either been saved from Ral Partha's web site at http://www.ralpartha.com/, or scanned in from their hardcopy catalog. Overview: A quite large model of a western dragon and a human male (the dragon's human form, according to the back of the box) that's well-sculpted but not without oddities (about which more in a moment). The dragon is standing on his hind legs, wings wide and arms raised in a pose that suggests he's casting a spell. A base is provided to allow him to keep upright without leaning on his tail, but this requires strong assembly  I don't think gluing this model together will give it the strength it needs, especially with the weight of the metal, but soldering can be quite difficult with pieces like this. A nice touch is the dragon's wristwatch, a small detail that sets it apart from other fantasy dragons. 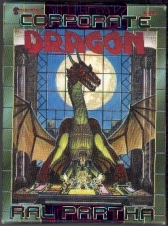 The human form is an older man with a moustache and dressed in a business suit; he could be used as any typical businessman quite well without necessarily being a dragon's "human form." As for the oddities mentioned earlier, this mainly concerns the dragon's anatomy. It's obvious he's a western dragon (two arms, two legs, two wings  western dragon) but he has a strange kind of belly that almost makes it appear a pregnant dragon... Also the coat of feathers on his back and what appears to be long hair on his belly (it's certainly not feathers or scales) are strange features for an animal that looks a lot like a winged crocodile in the color plates in the Shadowrun first and second edition main rulebooks. 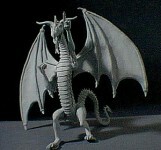 Still, a pretty good figure that's good as a non-specific dragon, if you're looking for one made for Shadowrun. Notes: this kit was introduced in 1992 and apparently went out of production only a few years later, as it's not in Ral Partha's 1994 catalog. I found mine in a discount bin in a game store, and the price quoted above is the full price before the discount was calculated in. 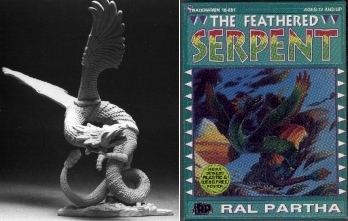 Overview: Quite a good and large kit of a feathered serpent, the dracoform with colorful feathers that comes mainly from Central America. The kit is cast in some kind of lightweight resin (my guess is polyurethane) with a pewter base that gives it some weight and will stop it from falling over too easily. The figure is well-sculpted although the pose is a bit strange; the serpent almost appears to be coiling around itself in the air. The feathers are well-defined over the entire body, which should make them easy to paint. (As a painting guide, the color plates in the first and second edition Shadowrun main rulebooks will be essential.) Although there are supposed to be eight parts in the kit, mine had an extra one because one of the legs had broken off and needed to be glued back on. There was also some warpage in the kit that prevented two parts from lining up properly, but this is easily fixed by heating the part with a hair dryer or boiling water (watch out you don't burn yourself!) and bending it back into shape; these are problems typical of resin models. Another snag was the fit of the wings, which wasn't good at all and required quite a bit of filling to prevent gaps and fix the wings firmly to the body. Apart from these relatively minor points, it's a very good kit that will almost certainly attract a lot of attention if painted up well. The price may seem high, but it's the largest dragon figure produced for Shadowrun, much bigger than either Dunkelzahn or Lofwyr and thus a lot more impressive in a collection. The cost is also a result of Ral Partha using resin rather than metal; resin models are more expensive to produce than metal ones for a number of reasons. 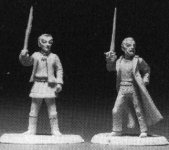 Overview: This set contains four figures, of a male human or elf gang member with an Ingram Smartgun, a ditto detective type with an Ares Predator II, an ugly-looking male dwarf with a laser crescent axe, and a Native American human female shaman with a staff (staff = magician as far as 25 mm figures are concerned, it seems). The sculpting is generally good, though I'm not too pleased with the detective's hat, as it's much too thick. The dwarf is also not really to my taste, being a kind of street punk type wearing shorts and entirely too many vicious melee weapons. He looks more like a refugee from Mad Max than a shadowrunner, I feel. On the whole I don't rate this set too highly, but perhaps that has to do with Ral Partha still having to get into the genre with this first set. Overview: Two male and one female deckers, all of them human. The two males are in combat poses, one firing a Sandler TMP submachine gun and the other holding a Colt American L36 pistol at the ready. The female decker is in a more passive pose, but still armed with a pistol. The figures look good, although the only thing that gives them away as deckers are the cyberdecks they carry with them; it's no as if they're engaging in particularly "deckerish" activities. Still, a figure sitting down at a terminal is not all that exciting either. Overview: These three figures are armed for a full-scale war, it seems. All three are male, and as the set's title indicates, human. I like the sword-waving figure, who's further armed with an SCK Model 100 SMG and an AK-97 in addition to a pistol and some grenades, even though his left hand had broken off on my example and had to be put back on with the help of some thin brass wire and lots of superglue. The figure with his foot up in the air is a bit of a strange one, pose-wise; he looks reasonably balanced, but what the hell is he doing standing there like that? It's probably best to glue some kind of box or something under his left foot to make him look less like a psycho ballet dancer. This guy is armed with a CMDT, some grenades, and a sword by the way. The third figure is not as good as the others, in that he's severely unbalanced holding an Ares MP-LMG as he does, his head appears too small, and not to mention he looks as if he ran face-first into a brick wall! In addition to his machine gun, he carries an SCK Model 100 and a few hand grenades. Overview: This set is an improvement over the Human Street Samurai in that the figures are generally better. 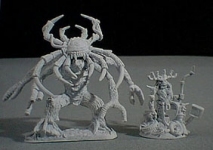 The set includes, from small to large, a dwarf, an ork, and a troll. The dwarf, however, has the problem most Ral Partha Shadowrun dwarfs seem to suffer from: he's dressed like an idiot. This character wears a uniform reminiscent of the late 18th/early 19th century (complete with monocle) but with "high-tech"/"modern" additions, like a groinal protector; his weapons I can't identify from FASA books. The ork is much better, wearing more sensible shadowrunner clothing (leather jacket, baseball cap, and some kind of aviator's G-suit trousers). He's waving a big spiked club over his head, and carries an SCK 100 SMG and a few handgrenades. The troll is better still, even though he's about a head too short for a true troll, even with his mohawk. His armament is impressive, being a belt-fed Panther assault cannon, an Ingram smartgun, and a troll-sized katana. Easily the best of the pack. Overview: Although this set is titled Elves, there is nothing particularly elvish about the figures in it, except of course for all of them having pointed ears. There are two females and two males; starting with the former, one is a mage-type waving a staff over her head and wearing a sensible and expensive-looking suit with cloak, apparently expecting cold weather. The other female is wearing street clothes and holding a Colt American L36 pistol while pulling a hand through her hairwhich, incidentally, she has a LOT of. She's also wearing shades pushed up onto her forehead. The first male is an equally long-haired decker who looks like he's just fired his Predator II, while the final elf is more a military/mercenary type with an HK-227 SMG in his left hand and a katana (which had an unwanted notch in it in my figure) in the right, plus a pistol, knife, and grenade on his web gear. This is a good set, giving widely different character types, and they can be used as humans just as easily as elves. 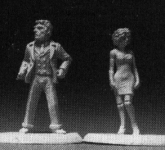 Overview: A set containing three figures, two of high-level corporate types and one of a bodyguard. Starting with the latter, this is a male ork dressed in a business suit and holding a Sandler TMP submachine gun. He's well-detailed, though the weapon is poorly proportioned. The first corp type is a human woman wearing something that holds the middle between a dress and a business suit, and holding a drink in her hand. This is a good figure, although she's rather big for a woman; you might get the impression that extensive surgery has been employed here :) The other corp type is a male human, also with a drink in his hand, and wearing a kind of business suit-slash-tuxedo and sunglasses, giving the impression he's at a party. He's also nicely detailed, and can be used well as a Mr. Johnson. Notes: The number 20-506 has now been assigned to a different set, titled "Mages." 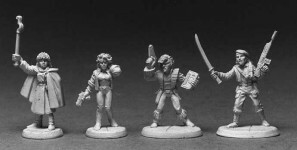 Overview: This set of four figures actually only has two characters in it: one male and one female, human or elf go-ganger, each with and without Yamaha Rapier motorcycle. The male is depicted as riding on the bike while holding his Colt M22-A2 assault rifle, as well as standing (or perhaps striding? the pose is a bit strange), pointing with that same rifle while reaching for a handgrenade. The woman walks forward, holding an HK227 SMG at the ready, while the other figure is her leaning against her bike (another Rapier) with the SMG. It would, however, have been much better if she'd been riding the bike rather than sitting on it, as that pose would have been much more useful for a game. Detail and anatomy are good on both figures, though the one riding the bike can be difficult to paint. The woman has to be glued onto her bike, but no more assembly is required, as the male is cast in one piece with his. Overview: Five figures, but only three different ones; all are dressed in fully-enclosing body armor with helmets, so all there is to paint are clothing and weapons. The figures are well-detailed, and four of them appear to be human with the fifth large enough to be an ork (or a really big human). The weapons they carry don't seem to be based on Shadowrun books, so what they're meant to represent is anyone's guess. One thing I didn't like about the set is that there are, as mentioned, only three poses for five figures; it makes it hard to remember which figure is which security guard if you're using them all together, but this is only a minor point about a useful set of figures to represent the opposition for shadowrunners. Overview: A somewhat strange combination, mercenaries and bouncers, but the figures in the set are good enough not to worry about this too much. Out of the four figures, three are human and one is a troll. The humans are a male bouncer, looking like he's about to punch someone's lights out, an male and female mercs, each armed with an HK227 and a holstered pistol. The male is bare-chested under his armor jacket, HK ready (note that in the photo above, it's missing the end of its barrel), while the female is almost throwing a grenade, with more hanging from her belt. Finally, the troll bouncer (who is once again very short for a troll) is just standing there with a sap in his hand, as if saying, "Or else..." Detail on all the figures is good, though anatomy could be better, especially the human bouncer's hands which are very big. Overview: A nice set of figures representing journalists and reporters, three humans and one dwarf. The humans are a female reporter with a microphone, adjusting her headset with her right hand, a male cameraman who is not actually using his camera, wearing a long coat and shades, and one male wearing a trenchcoat and writing something on a notepad or PDA. The dwarf, wearing a hat and an open jacket, is filming with his camera and looks like he's either ready to run away to safety, or taking a step back to get a better angle. The figures show good anatomy and their poses are believable; the detail is mostly good, although the dwarf's face looks more like that of a gorilla than anything else. Notes: The number 20-518 is now used for a set of Metahuman Subtypes. Overview: Since the Native American Nations are an important factor in Shadowrun, some figures for native Americans are quite helpful. These are well-detailed, but unfortunately rather stereotypical (in the same way that all magicians have staffs). They look like you'd expect Indians to look based on Hollywood movies, but with some 21st century items addedmainly weapons. According to another review of these figures I read, by someone who appeared to know something about native Americans, their dress is from the plains Indians of the American mid-west. That would make them strange ducks in a Seattle pond, I guess. Anyway, the four figures are all human (metahuman tribals are in set 20-522), one female wearing a fringed jacket over some kind of top and semi-skirt-type-thing, and holding a CMDT combat shotgun in one hand. Of the males, one is a shaman type holding a spear with feathers; this and the big knife in his belt are his only weapons. The second male is a warrior with a tomahawk in one hand and an HK227 in the other, while the last figure holds a bow in his left hand and an SCK 100 SMG in the right. The poses are mostly okay, although I think the woman is holding the shotgun with too much ease, and the bowman's pose just doesn't work. On the other hand the shaman's pose looks very good, somewhat reflective, like he's standing on a hilltop overlooking the land below. Overview: Two male and two female Asian figures, all human, make up this set. The first male is dressed in a business suit with a long overcoat thrown over his shoulders, holding a Colt American L36 pistol is his right hand, and with a facial expression of a rather stern man. Perfect as some kind of Yakuza boss, I feel. The other male is more an enforcer, armed as he is with a wakizashi (a Japanese short, curved sword) and an MP 5-TX submachine gun. He's wearing casual clothes: sweater, pants, and a knee-length coat, plus shades. The women are a magician with upraised staff, wearing a short and revealing dress (another one of my pet peeves with 25 mm figures...) but she doesn't have any other equipment. The final figure is wearing a school uniformblouse, tie, skirt, knee-length stockingsand has a briefcase in her one hand, and an SCK Model 100 SMG in the other. It looks like she's saying something, and overall gives the impression of a terrorist announcing to the passengers that the plane has been hijacked. Whatever, it's in my opinion the best figure of the four. Overview: I have no idea what "Strike Force Bravo" is supposed to refer to, but I like the figures in this set anyway. It contains a male and female human, a female ork, and a male elf. The male human is a decker shouting something and pointing a Predator II pistol at someone or other. The only weird thing about this figure is the way he's holding his deck; it reminds me of the way someone would hold a sign, and certainly not a computer costing hundreds of thousands of nuyen. The female human is another magician, long-haired with an upraised staff and a short, revealing dress (*yawn*...), while with the female ork the designers appeared to have tried for a punk look: long mohawk, chain mail "body armor," knee-length boots, etc. She's aiming a vz 88V assault rifle with one hand while the other holds an unidentifyable SMG (it looks a bit like an M3 "Grease Gun" SMG of World War II), and she then has a Sandler TMP on her back and a few grenades on her belt. The elf is a street samurai type, with long hair in a ponytail, a Mossberg CMDT shotgun in his hand and his spurs extended. On his back is a sheathed katana and he also carries some grenades on an ammunition belt. The figures are well-sculpted, with good anatomical proportions and equally good detail, and can easily be used to represent most shadowrunners. Overview: I really wish Partha would produce a set of useful, believable dwarfs. The ones in this set are fine as far as sculpting and detail are concerned, but clothing-wise it's a different story... But let's start with what you actually get in the blister pack: one female and three male dwarfs, all gang members (according to the set's title), but obviously a from a poser gang. Of the three males, one is wearing a World War II German officer's uniform complete with monocle and cigarette holder, the second what appears to be a First World War German soldier's uniform with Pickelhaube (spiked helmet) and a flame thrower on his back, and the third looks like a Hell's Angel with a German WWII helmet, stick grenade, and gas mask cannister in addition to the Sandler TMP submachine gun he's aiming. The female dwarf is the only one who's sort of usable as any other kind of character, as she's wearing a short dress, a jacket, and a beret, but she is holding a big chain saw and has a look on her face that would make trolls run away... I don't quite know what to make of this set, as on the one hand it's well-produced, but on the other it is just a bit too ridiculous to actually use in a serious game. 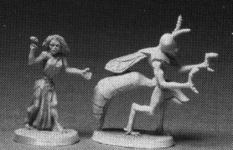 Overview: Insect spirits are always nice to have, because they're difficult to represent with figures from other (non-Shadowrun) lines. However, this set is disappointing. It contains a wasp "queen" that looks too small for a queen, and not very much like a wasp, especially because it has only two pairs of limbs... It's probably best to see this as some kind of near-perfect flesh form spirit rather than as a queen, in my opinion. Much the same goes for the "human host"at first sight it's a terrified woman wearing something resembling an evening dress, but on closer inspection, the whole right-hand side of her body is insect-like, so she's definitely a flesh form, not an innocent human. There is some assembly needed for this set, namely gluing one of the wasp spirit's arms to its body. It's obviously intended that this lines up with the "human host" so that the wasp is grabbing her (it?) by the arms or shoulders. Overview: This is another one of those figures that are nice to own, but not very useful to have around a game. Dzoo-noo-qua are trolls infected with HMHVV; they're described in Paranormal Animals of North America, and the figure does look like the artwork in that book. Over his right shoulder, he's carrying away a female human/elf wearing a bathing suit (who is the reason for the "2-in-1" notation for the number of figures in the set). It's certainly a well-sculpted figure that's good to paint, but what do you do with it? Overview: These figures are based on an illustration on page 105 of the Tir Tairngire sourcebook, showing a SWAT team entering a building through the windows. The figures do justice to the original artwork, faithfully representing the equipment carried and worn by the team in the illustration, though in different poses. Of the four figures, three are male and one is female, with one of the males being a magician with a staff (again, exactly as in the artwork). All are wearing full body armor with helmets/gas masks, so there is no flesh showing at all. Their weapons are not "Shadowrun-standard," not to mention a bit strangely proportioned. The SWAT team members themselves also do not comform too rigidly to human anatomy, though this could be blamed on the armor they are wearing, to a degree. Still, it's a handy set of figures if you're in need of a SWAT team. Overview: After the disappointment of the Wasp Queen/Human Host, this set is much better. It contains one medium-sized and one LARGE (4 cm high!) mantis spirit, both true forms with outstretched arms ready to attack. Detail is very good on both, and they really look like the insects they represent; careful painting is in order here. You will need to assemble the figures, mainly adding their heads and some arms and legs which cannot be cast as one with the bodies; I'd recommend either soldering them (if you've mastered that technique) or using two-part epoxy glue, because the bonds will need to be stronger than superglue can give with parts like these, if the figures have to stand up to regular handling. This is easily my favorite set of Shadowrun figures. Overview: This set has more to it than three figures plus a stretcher. It represents three DocWagon employees, wearing full body suits of armor, going about their duty of saving clients. One of them is kneeling on the ground with a syringe in one hand, a kind of chainsaw in the other, and a whole medkit laid out around him (together with a SMG). 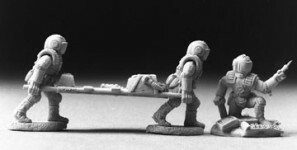 The other two have identical bodies, but a choice of arms: either carrying a stretcher (as in the photo), or one of them carrying a large shotgun with two hands and the other having an SMG in one hand and a medkit in the other. Detail is good on these figures, down to the molded-in DocWagon and HTR (High Threat Response) logos on their clothing; the sitting figure is the better one of the pack, though. 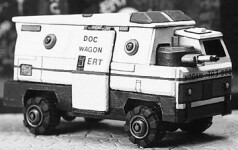 This set goes together neatly with the next kit, of a DocWagon ambulance. All that said, it's a neat little model; it's somewhat small compared to vehicles by other manufacturers, but its hollow interior makes up for that. It's not cheap, but it's well-made and a good addition to a collection of Shadowrun figures. Notes: In the kit I bought, the left-hand side of the hull was missing; after I e-mailed Ral Partha about this, they rectified it by sending me the missing part right away; good customer service, in my opinion. With some work, it should not be too difficult to modify this vehicle into another RoadMaster or MobMaster variant, something I'm planning on trying someday. 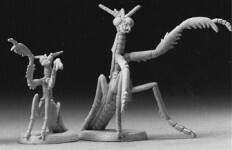 Overview: Two character figures based on the adventure Mercurial. Maria Mercurial herself is a frail-looking character with her trademark dermal plating (from the adventure) clearly evident on her arms and legs and showing very good detail. Since these are highly chromed, I didn't paint them, but polished the bare metal and applied a wash of thinned black paint to accentuate the detail. Kyle Morgan is wearing a business suit and holding an unidentified pistol; his face is well-detailed, but the rest of his body less so; there is especially a lack of folds or creases in his clothing, which looks like it's just been ironed. The facial features of either figure, though, do not particularly resemble the art in Mercurial, which is after all what you'd expect from a set of figures like this. Notes: Set number 20-563 is now "Wolframs Gang," a completely different set to the one described here. Overview: Everybody's favorite (or perhaps the opposite) immortal elves feature in this set, taken from the ending of the Harlequin adventure/campaign book, both holding swords and looking ready to duel. Harlequin is wearing a long coat and street clothes, much like in the end of the adventure, while Ehran's clothing has been copied from the color art in Tir Tairngire (which can therefore be used as a painting guide). Too bad his facial features weren't taken from that book as wellthe ones on the figure hardly resemble those in the book, which is a pity. A similar comment could be applied to Harlequin, however by painting his face in his full "war paint" this is not so apparent as with Ehran. Apart from this, the figures are rather good, even if they are of little use in a game; if you like the adventure this is a set you might want to own. Notes: This set has been replaced by Harlequin & Aina, with the same number but a different figure for Harlequin. Overview: The late president-for-a-day Dunkelzahn (note the spelling, please, Ral Partha...) makes an impressive figure in 25 mm. He's depicted sitting on the ground with his wings folded, and pointing to something or other with his left hand, his tail curled behind him. The parts show good detail of scales, teeth, and so on, and the figure really looks like a western dragon. Of course he need not be painted up as Dunkelzahn, you could make him just a generic western dragon if you like. Dunkelzahn himself is, according to the cover of Portfolio of a Dragon: Dunkelzahn's Secrets a blue dragon, and some sources give him a silver underside. On the other hand, the 2057 election poster on the front of Super Tuesday!, shows him as a green/yellowish dragon... For what it's worth, I painted mine blue with silver. Assembly is needed for this figure, and I suggest either soldering or using epoxy glue, as super glue will not be strong enough to allow the figure to be handled often. Overview: Possibly the most dangerous dragon in the world, Lofwyr is the president of Saeder-Krupp, the world's largest megacorp. 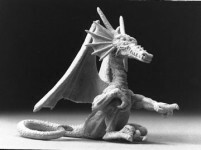 This large figure assembles from a fair number of parts into a good model of a western dragon, which however does appear much slimmer and of different build than Dunkelzahn, especially where the head is concerned. It's a well-detailed figure nonetheless, and impressive in the way the dragon stands on his rear legs with wings half spread out. However, the figure is very poorly balanced, and mine leans on his right wingtip to keep upright (going by the photo reproduced here, I'm not the only one who's discovered that problem). A base would be in order for this dragon, I feel. A color painting of Lofwyr appears in Tir Tairngire, but according to the owner of the original painting, Shadorat, the plate is very dark compared to the actual painting, so you might want to keep that in mind when choosing colors for the figure. Lofwyr is a redbrown/golden dragon, so I opted for a bronze back and sides with a golden underside and wings, keeping the painting in Tir Tairngire at hand while painting. You can, natually, choose to paint this dragon in any other reasonable color to represent a western dragon other than Lofwyr.